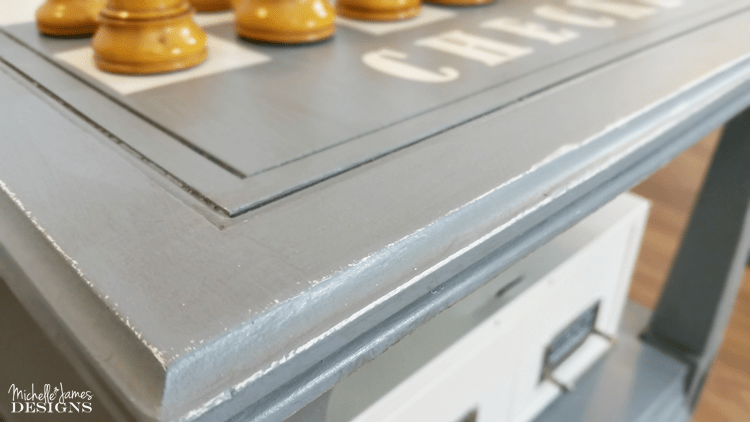 Spray paint your way to a gorgeous game table and storage for game pieces. I am having a lot of fun this month with all of my furniture projects. Some months I have more than others and this month included two big pieces. Now that they are out of the garage I had some room to complete a small, gorgeous game table! This month for the Fab Furniture Flippin’ Contest I used my HomeRight paint sprayer for this bed headboard and footboard makeover. 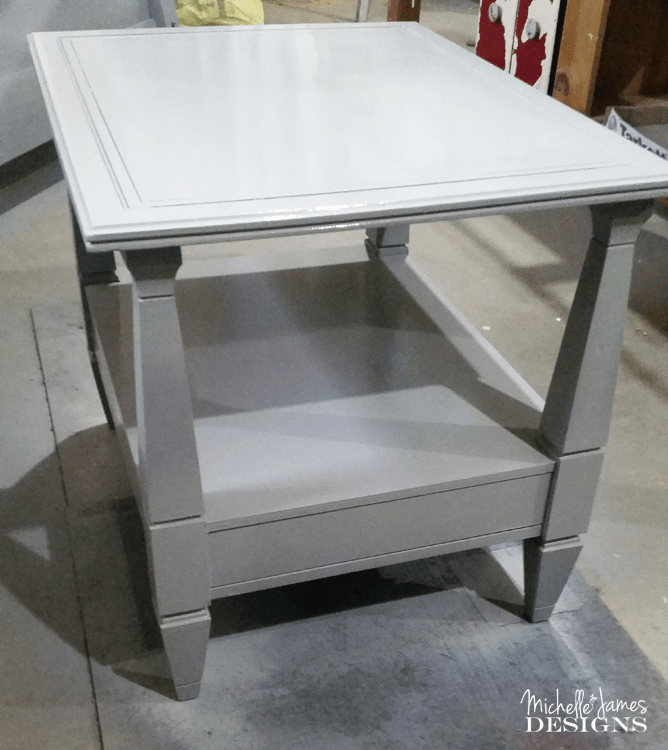 Well while I had the sprayer going I also gave a coat of the same gray paint to a small end table that had been sitting the in garage since spring. I decided to finish that this weekend and spray painted my way to this game table! 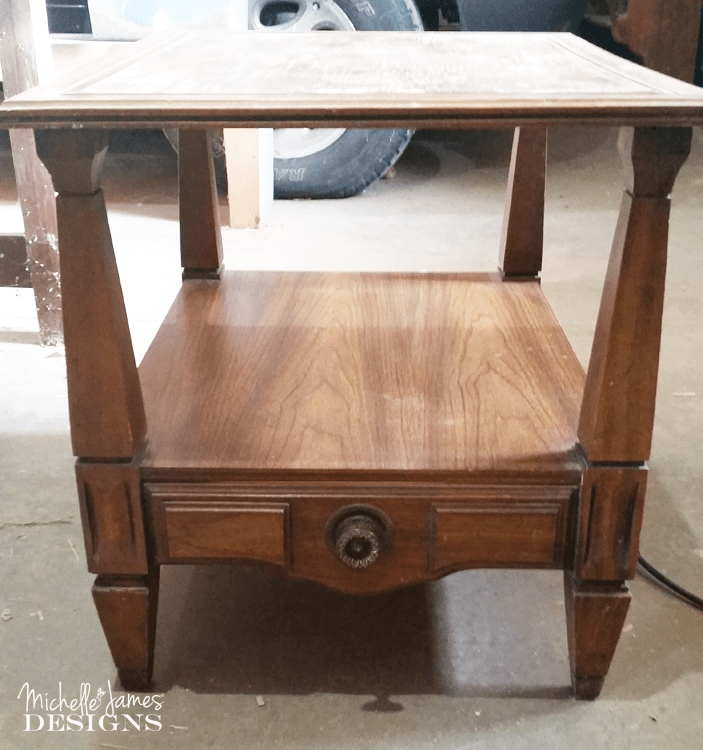 This project is part of the Furniture Refresh. 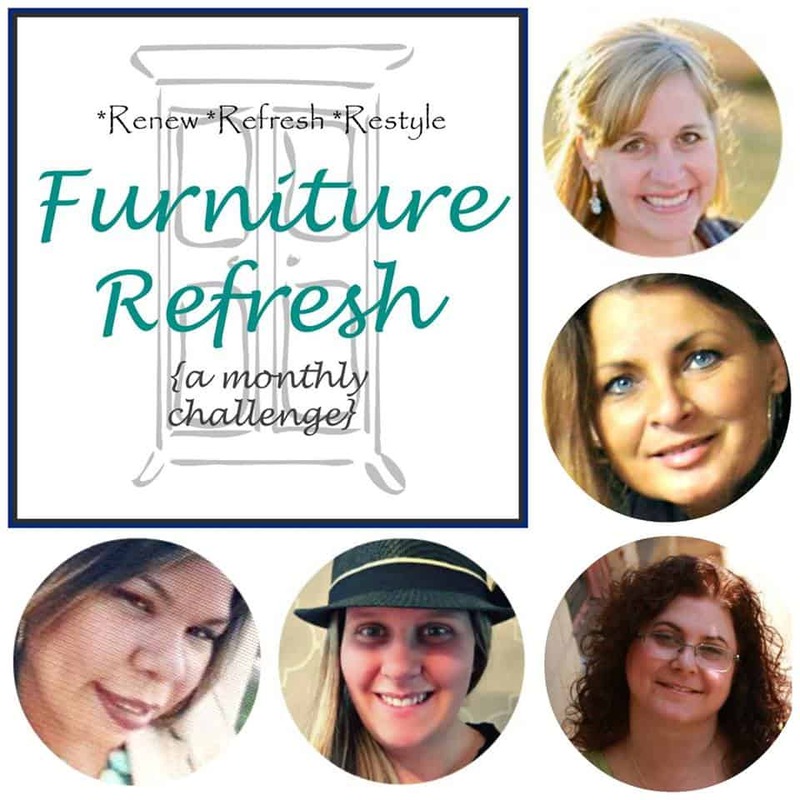 I am working with some other very talented bloggers and we all makeover a piece of furniture. Here we are! If you are my friend then you know that I despise games. I was traumatized by a Sorry match when I was a child and it haunts me to this day. There must have been a lot of crying and whining going on because my mom got up from where she was sitting, grabbed the board and all of the pieces and through it all in the fireplace. It all went up in flames. That was it for me! I did play Srabble the other day with my family but only because Hailey hates it that particular game too. LOL! We were miserable together. LOL! Jeff loves games especially chess. 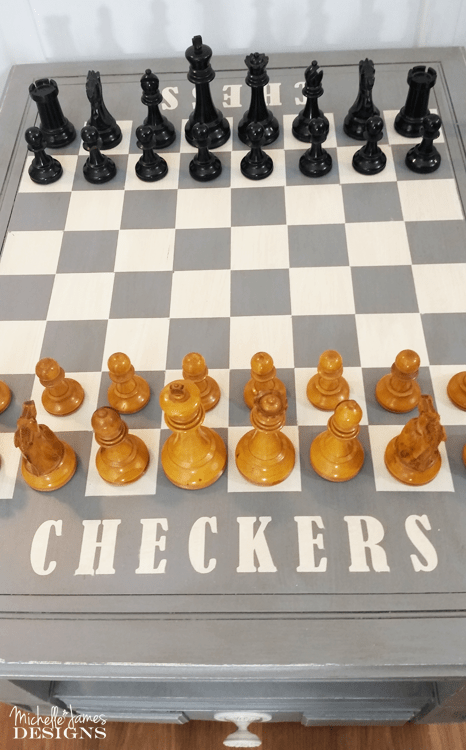 He is not a big checkers fan but why not include it for the people who aren’t well versed in chess. 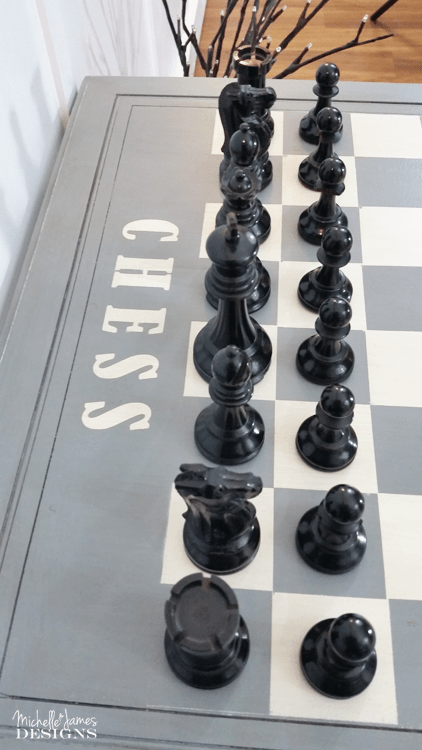 I was trying to come up with a grand plan for this table and he suggested the chess board. 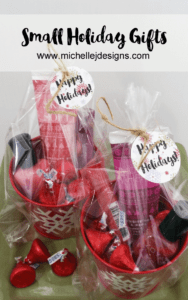 I was thrilled to have a vision and it ended up being a really fun and relatively easy project. This is what the table looked like when I started. It is the sister to the fun map table I made a while back. They both have the same lines and hardware. 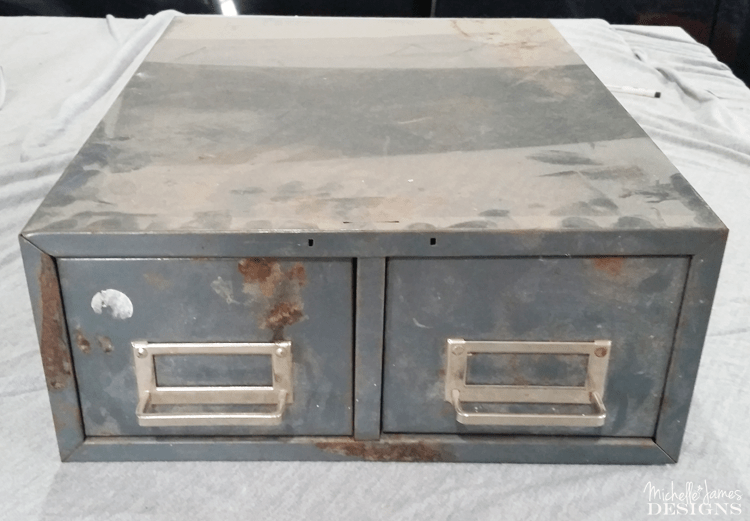 I also used this beat up and rusty file drawer. It will hold the game pieces. I think I got this at a garage sale but the table was from a flea market. I prepped both pieces by cleaning them off really well and sanding down the bad spots and rusty areas. As I mentioned earlier I had the HomeRight paint sprayer out so I just gave the table a couple of coats. I have found that latex paint works the absolute best in the sprayer and you can get a very nice, smooth finish. To get the game board and the words “chess” and “checkers” I used my Silhouette Cameo machine. I measured my table and looked at Jeff’s chess board to figure out the squares. The needed to be 2 inches each and I had to cut 32 of them. The Silhouette vinyl has been great for making stencils so that is what I used for the stencils. I used this same stencil process on these coordinates throw pillows and on my awesome new clock. These pieces were all used as masking. Everywhere I wanted the table to remain gray, I stuck down a stencil or a mask. So I created the checkerboard pattern on the top and the stencils centered on each end. I didn’t want a bright white for this one. 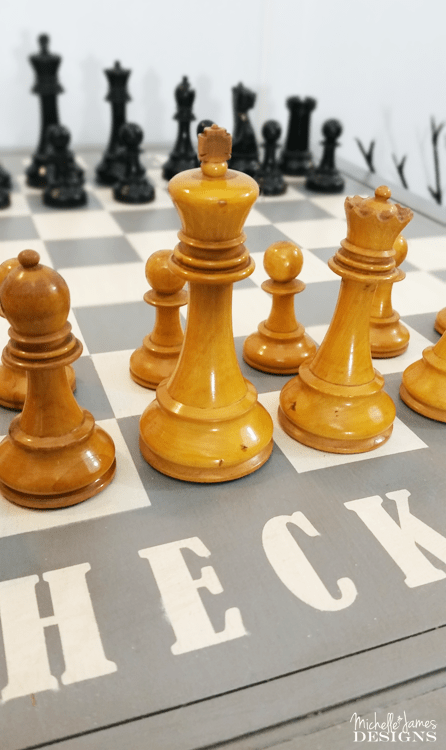 I thought the game pieces would either be an off white, Ivory, or a tan like the ones I used in my photo. So I chose Heirloom White from ….wait for it…Rust Oleum. LOL! My fave!!! It took a couple coats before I could remove the masking to reveal the game board! I was thrilled with the results. There were a couple of little over sprays that I touched up with a little bit of gray. Then it was just a matter of distressing the sides and spraying the hardware with the same Heirloom White. Next came the file drawer for the game pieces. The drawer on the table is a big fake so I thought it would be nice to have somewhere to store the pieces. 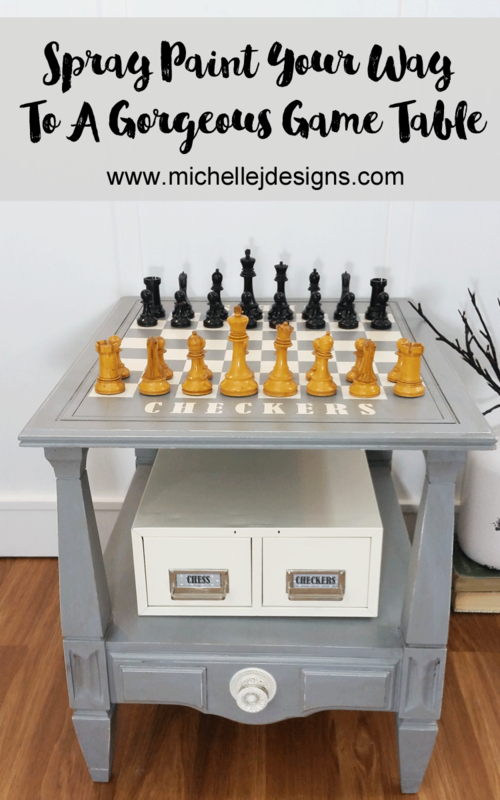 One drawer will hold chess pieces and the other will hold the checkers pieces. The drawer was sprayed with the same color. 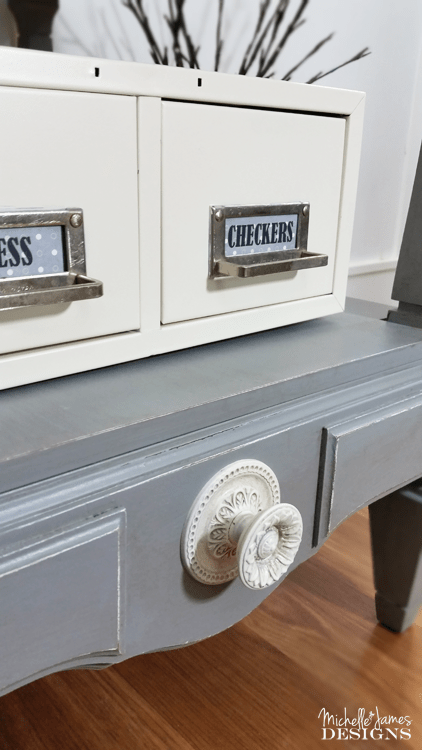 I labelled each of the drawers by printing on scrapbook paper. I was afraid the metal drawer would slip off the table when the drawers were opened so I added some grippers on the bottom to help it grip. It turned out much better than I expected and really was fun to make! I hope you like it. If so go ahead and Pin it! 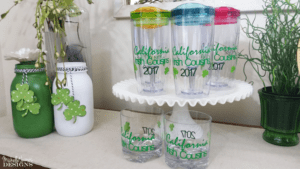 Don’t forget to visit all of the other blogs to see their finished spray painted projects too. This is so fun!!! I love that you incorporated a place for the games pieces too. I love chess and think a built in dedicated spot would be perfect. Thank you for the inspiration. Hi Sue! Thanks so much! 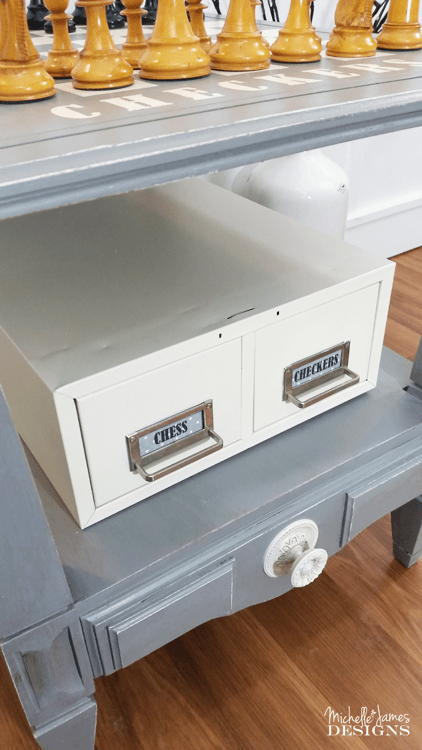 It definitely needed a place for the pieces and I had this file drawer laying around in the garage. It was perfect. I am so glad you like it! Lovely job! One of your best! I’m so inspired to use my sprayer after reading this post. Congrats! Thanks Q’s. I love my sprayer. This was a really fun table. Jeff had a great idea! Wow Michelle! 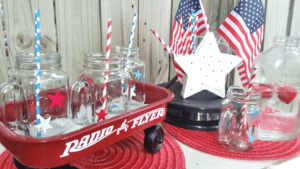 I love how the table turned out…it’s perfect! And what do you know? I love heirloom white too. It is definitely my “go-to” color. I really loved using spray paint for this project and will absolutely be doing it again. What a wonderfully smooth surface! Hi Michele! Thanks so much! This really was a fun theme. I spray just about everything. LOL! 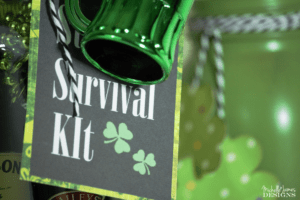 Thank you for hosting the challenge each month. This is such a cool table! I love everything about it! Great makeover! Thanks Michelle! I am not a gamer at all but I definitely had fun creating this…for someone else. LOL! I am actually amazed at this game table you made and that it was spray-painted to begin with is something that I have not yet tried to do. Beautiful table Michelle. All your creations inspire me and are memorable. Thank you Sue! I love your comments. They always make me smile. Michelle, does your husband love it? Mine would! He is a chess fanatic. 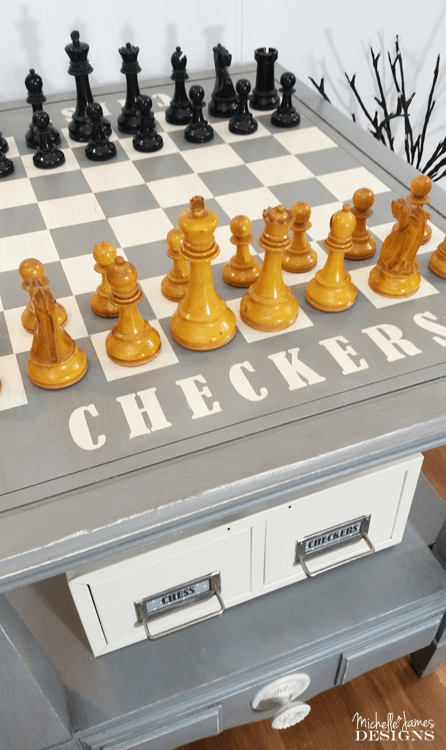 I love how you transformed that end table to the perfect game table…and anyone would have a hard time recognizing that card catalog to hold your chess/checker pieces. Now, get on in there and face your ‘Sorry’ trauma face on! You’ve got this! OMG I have tried to face the Sorry trauma more than once but I really have never played that game again. I actually sold the table to a family with three girls that love to play games so I know it is being used and they are so happy. It makes me all warm and fuzzy inside. Thanks so much Lynn for your “game” encouragement. I appreciate it!